As part of an effort to become the first Certified Community Wildlife Habitat in Texas, the City of Austin challenged neighborhoods to encourage homes and businesses to set up Wildlife Habitats on their property. The objective was to get as many sites to become certified as natural habitats by the end of October. 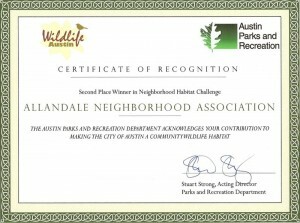 Allandale took the challenge and succeeded in placing second overall among participating neighborhoods with 25 new certified habitats within the challenge period. Jester Estates took first place with 36. Getting certified was relatively easy. It involved providing food and water sources, cover/shelter for wildlife, and practicing sustainable gardening practices such as mulching, reducing/eliminating the use of invasive non-native plants, and conserving water. The what’s-in-it-for-me factor is by setting up these wildlife habitats you attract more birds, toads, lizards, and butterflies to your yard. The Habitat Challenge winners will receive: 1st place: Picnic celebration in a local park for all residents who certified their yards during the challenge. 2nd place: Native trees for neighborhood treee planting projects. 3rd place: A two-hour Wildlife Habitat Design Workshop. Cheryl Silver, certified wildlife habitat steward, took responsibility for promoting the Habitat Challenge and helping with planning, answering questions, and directing people to related resources. Part of the project was to remove non-native invasive plants. Allandale volunteers accomplished this at the July Northwest Park pond cleanup organized by Allandale’s Beautification Chair Linnea Lemon. During that cleanup volunteers skimmed duckweed from the surface of the pond. 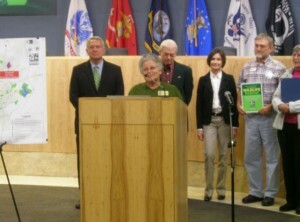 Cheryl represented Allandale at the November 20 City Council when Council Member Lee Leffingwell read the proclamation awarding Allandale second in the Habitat Challenge. Each neighborhood representative had an opportunity to talk briefly about the project. Cheryl told how excited she was with the project and relayed a story from Steve Owens, one of the neighbors whose yard became certified. His son surprised him one day after reporting hearing a bird call from a bird in their yard he learned about with his dad on the computer. The excitement about the project is understood when you see the wildlife habitats. 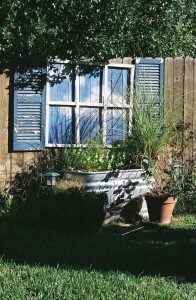 Above is a photo of one of the aquatic habitats Trish Roberts-Miller created in her yard. 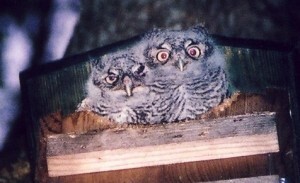 To the left is a photo of owlets from another habitat in her yard. CLICK HERE TO SEE PHOTOS from other Allandale residents that were certified. Here are few more comments from Cheryl and people in the neighborhood who have gotten involved with the project. From Trish Roberts-Miller: “We have the sign up on our fence, and it gives me a thrill every time I see it!” Of course, this year’s challenge has concluded but that should not stop you from creating a wildlife habitat in your yard and getting it certified. You will find more information about here: http://www.nwf.org/backyard/certify.cfm. You can also contact Cheryl at csilver2 [Email address: csilver2 #AT# austin.rr.com - replace #AT# with @ ] or call her at 454-7219.